Allie gets cameos all week this week, since October is her birth month and we're celebrating! Freekibble is donating ALL Halo Pets kibble raised today through Friday to help animals who are victims of Hurricane Sandy. Please visit, click and share these links! And - just for fun: a spooky prank by LG, to demonstrate how lifelike their TV monitors are. 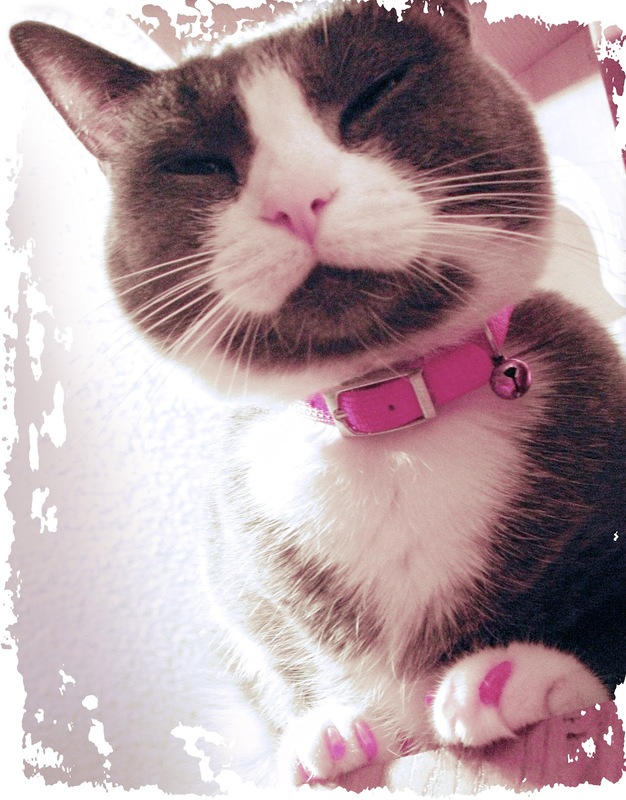 Oh, Allie, look how adorable you are all decked out in your pink collar and toesies! They match your cute pink nose! Squee! Have a happy Halloween and a wonderful trick or treat. Allie - Mario Smooches sweetie. You are so cute. Allie - Instagram Style.. lol.. cute. I love all the pink. I can't help but wonder if anyone threw up while on that elevator..
You look quite lovely, Alie! OMC!!! I love that video...what a clever idea! That would be SO scary though... I'd totally FALL for it. Happy Birthday Month, Allie! We should get our nails done together. You know...a girls spa day. I shared about FreeKibbleKat on my Facebook page! Woo Hoo , looking GREAT in your pink collar and toesies ! Happy birthday month to Allie. You look very sweet there, Allie! Allie! Yous looks marvelous darling! And yous NEVER EVER get mes in that elevator!!! Thank you for letting us know about the Free Kibble fundraiser to help the cats that were in Sandy's path. We are purring our hardest for them. Yay! Spotlight on Allie! Happy Halloween! Hi Allie! That sure is a sweet picture - happy Birthday Month! We loved that video :-) We got a big laugh from it. Thank you for sharing it. That video was too scary! Love the pink nail caps! and that video was awesome! Allie, you are so pretty! That was a freaky trick to play!